Over 3,000 companies have trusted NetHire with their Sourcing and Talent Acquisition needs. Large or small, NetHire has a solution for you. Please scroll down to learn more about NetHire! How does NetHire get you the Best Candidates? We build the best Career Sites for your website that are applicant friendly, SEO optimized, connect your company to people who want to work for you and are promoted through our NetHire Job Posting Network to increase traffic and applicants. Social Media connects the world and we are constantly pushing your jobs out to potential candidates through our networks, Job Posting Partner Network and Facebook Applications, making every job sharable and allowing you to connect and use the power of your social contacts. Through our Recruiter Network Program we connect our clients with recruiters. No longer just one recruiter but an entire network searching for you. We offer varying degrees of recruiting: including social searching, shortlisting and flat-rate contingent recruiting. Why is NetHire Better Technology? Our Candidate Management System (CMS) is stand-alone software that is included FREE with every NetHire Job Posting to review, rate and move candidates throughout the entire hiring process; from source to hire. We provide analytics specific to you and your hiring situation. Access analytics from your Dashboard covering your entire account or specific data in regards to a position. Monthly Analytics Reports are also emailed and accessible in your dashboard to provide you with all the data you need. 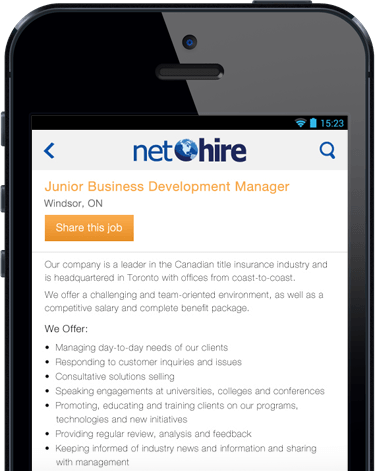 We make it easy for candidates on-the-go to apply to your positions from their mobile devices. They can instantly attach resumes from cloud storage services such as Dropbox and Google Drive, social networks like LinkedIn or upload a resume right from their phone. Never lose a candidate again. 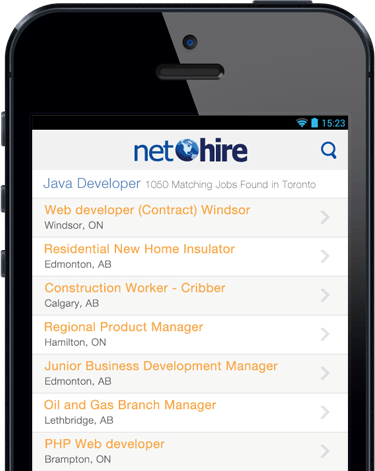 NetHire allows you to keep a record of all the people who have applied to your positions. Search for those candidates by location, keyword, skill and a variety of other parameters. Build a pool of people who want to work for you. What makes NetHire a Better Service? We offer the option to buy most products and services online however at any time you can call and speak to a real person. Every NetHire client has a dedicated Account Manager to assist them and see to any questions or concerns they may have. All NetHire postings have a Response Manager who oversees their response and all other services have a Project Manager who will oversee implementation. We are available from 8 am - 8 pm every weekday. No matter when you want to speak to someone, NetHire is available to assist you. 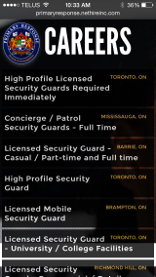 We have everything to take you from Source to Hire! Contact NetHire today to speak to an Account Manager!